Prestigious Two – Monitor DXT Released! I’ve finished the fine-tuning of the loudspeaker and I’ve published the complete design write-up. I think it turned out to be a very nice modestly priced loudspeaker design. The SEAS DXT tweeter, although not my absolute favorite tweeter is a very interesting concept with great potential and I hope to see more of its kind from SEAS and other loudspeaker driver unit manufacturers. I’ve tested and used the DXT tweeter in several designs and I think it really shines when used with a LR2 (acoustical) filter topology. The bass from the small SEAS U16RCY/P is very good and I think the warm mid-range character it reproduces, will appeal to many people. I also think the cross-over design worked out the way I wanted, with a minimalistic design approach and with very few components. It’s not often a loudspeaker design work out as good as this with a first-order (electrically) filter topology, but both these good drivers can handle it. This is the last design I publish before the family vacation starts, but stay tuned I have several exciting designs coming soon. First of all I’m starting the “Sequence Three – Grand Reference” build this summer and parallel to it I will start the work with the “Revelation Two – Monitor MkII”, which will be released with two new different tweeter flavors. Sequence Three – Grand Reference – Construction! Read full article |Comments Off on Prestigious Two – Monitor DXT Released! Sequence Three – Grand Reference Construction! This is a construction which I will build in parallel with other smaller projects and I think it will take some considerable time to finish it. 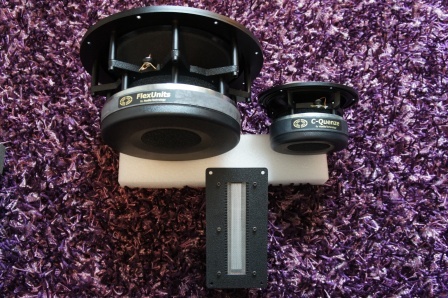 I have no rush into getting this “Reference” loudspeaker up and running, but I will publish measurements and design thoughts here in my construction blog, along the way the design project progresses and develops. Here I will use the RAAL 140-15D Ribbon Tweeter. This is a ribbon tweeter that many people regards to be one of the best ribbon tweeters on the market and it’s supposed to have very low distortion compared to other ribbon tweeters. Time will tell if it’s true or not and I will release extensive measurements to evaluate the claims. 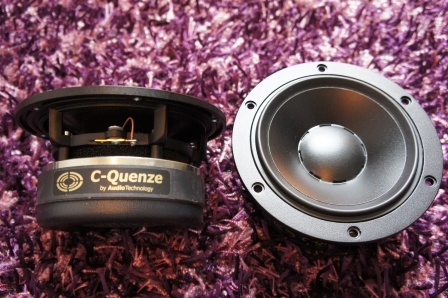 Here I will use the AudioTechnology C-Quenze 15H-52-12-06-SDKM. 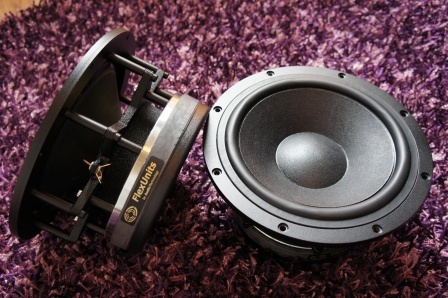 This is the mid-range version of the 15H 5” mid-woofer and it has a special rubber mid-range surround. This is the “over-hung” version with a Kapton voice-coil former. According to AudioTechnology the “over-hung” version of the mid-range has a bit more detailed mids and “monitor” characteristics as well as higher sensitivity compared to the “under-hung” version. 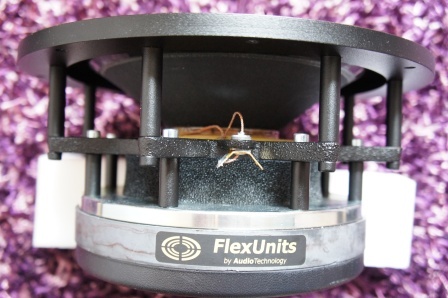 Here I will use the AudioTechnology Flex-Units 10C-77-25-10-KAP. This is a 10” driver with a woofer cone made from two thin carbon reinforced paper cones. The result is an extremely rigid and stiff cone. The kapton voice-coil former is laminated with aluminium foil and presents a very low mechanical resistance, which allows the driver to play bass with authority, even at low levels. 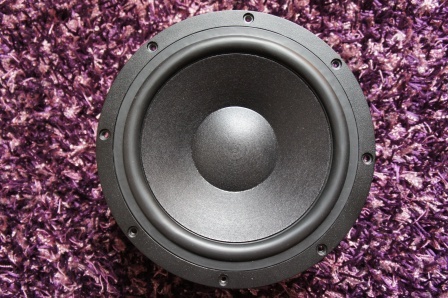 The mid-range has the special rubber mid-range surround with an unusual looking shape. 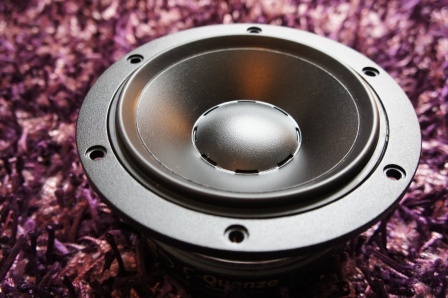 The mid-range also has a similar ventilation of the voice-coil, as the woofer. All the “Sequence Three – Grand Reference” driver units showed together. Note! 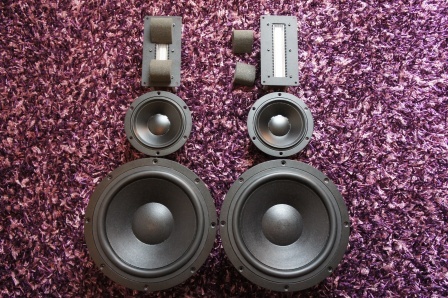 the huge magnet size on the woofer compared to the mid-range, which also have large magnet considering its size. Read full article |Comments Off on Sequence Three – Grand Reference Construction! Prestigious Two – Monitor DXT Construction! I’ve started a new build project called “Prestigious Two – Monitor DXT” and currently I’m in the fine tuning, listening test and final measurement project stage. This time I’ve used less expensive driver units from the “Seas Prestige line”. 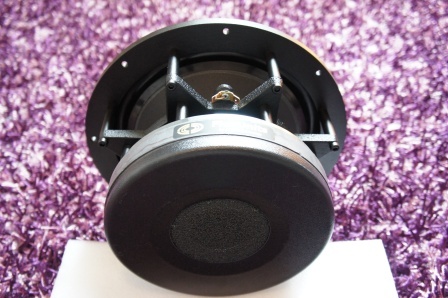 The mid-woofer used is the U16RCY/P, which has a woven polypropylene cone and phase plug. 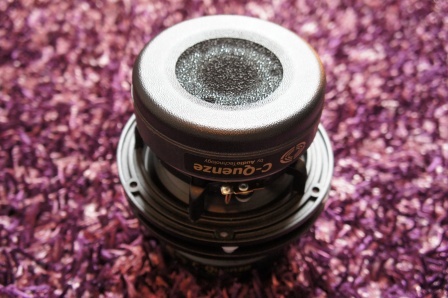 The mid-woofer has a smooth extended frequency response with a controlled roll-off, without nasty cone break-ups. For its size it has a large radiating surface (99cm²) and the bass performance is very good. A variant of this mid-woofer is used in the Sonus Faber Liuto loudspeaker series as well as in the Abrahamsen FS401 loudspeaker. 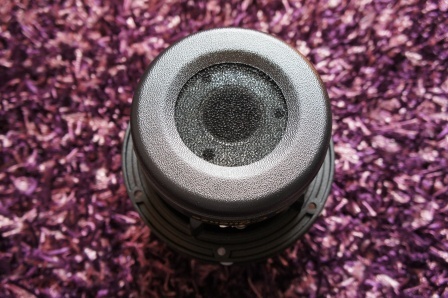 The tweeter used is the well-known and among DIY:ers popular 27TBCD/GB-DXT tweeter, with its unique DXT lens and great off-axis frequency dispersion. I’ve used both these drivers in active as well as passive loudspeaker designs before, but I haven’t been fully satisfied with the end result and I have always thought they could perform even better and now I think I’ve succeeded! The DXT tweeter isn’t the easiest tweeter to work with. Don’t misunderstand me, it’s not that hard to shape it in to a working cross-over that on paper looks good, but in my opinion this tweeter has a tendency to become dull, un-engaging and less musical in certain configurations. I found this tweeter to work and sound the best in a second-order LR filter topology (acoustically). This means that in order to use a simple electrically first-order filter it needs to be crossed-over a bit higher up in frequency to ensure that it operates within its “comfort zone”. In this case I’ve targeted a 3kHz cross-over point for the design. On the other hand, this requires a mid-woofer capable of a 3kHz cross-over point without sacrificing any off-axis dispersion (beaming) and to match the DXT tweeters excellent and controlled off-axis frequency characteristics. The Seas U16RCY/P fulfills that together with a very smooth and controlled frequency slope roll-off, without the need to do corrections for nasty cone break-ups. To sum up, this all ended up in a very simple cross-over design, which was one of the goals of this loudspeaker design. The mid-woofer cross-over filter section is an electrical first-order and is very simple and consists only of a large coil (L1) that shapes the cross-over slopes to a LR2 roll-off with a targeted 3kHz cross-over point. The inductor (L1) also tunes the “Baffle Step Compensation” (BSC). The tweeter cross-over filter section consists of a single tweeter padding resistor (R1) and a first-order electrical filter (C1) that shapes the cross-over slope to a LR2 roll-off with a targeted 3kHz cross-over point. The value of (R1) can be changed to tailor the tweeter level to personal preferences. The tweeter is connected with reverse polarity and (C2+R2+R3) shape the tweeters frequency response and flatten the response at higher frequencies. Simulated 15deg off-axis frequency response with a targeted second-order LR topology (acoustical). Cross-over point at 3kHz. 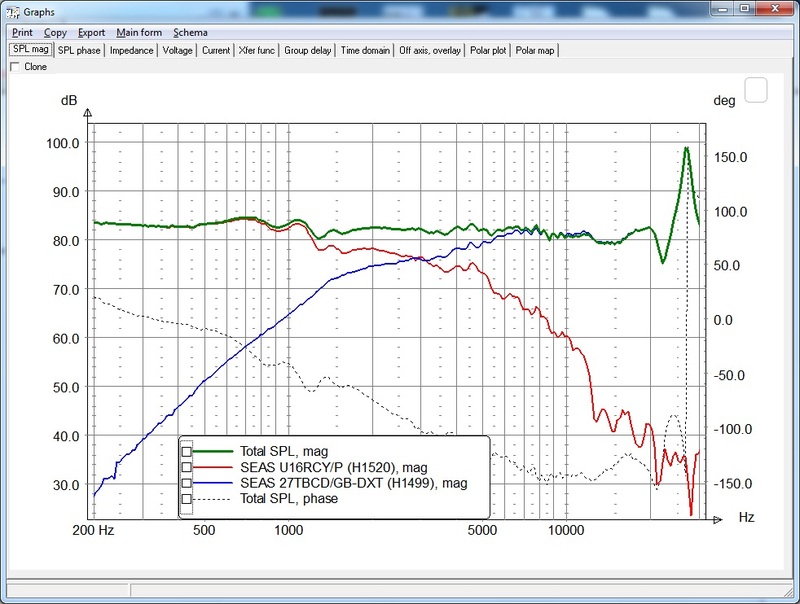 Note the tweeters sharp peak at the hard dome break-up frequency! Read full article |Comments Off on Prestigious Two – Monitor DXT Construction! I’ve decided to scrap the “Revelation Three – Grand Reference” project, but all ScanSpeak fans don’t despair, there will be a scaled down “Baby Grand” three-way based on ScanSpeak drivers as well as a couple of two-ways stand-mounts later on. Instead, the new “Reference” project is based around AudioTechnology bass and mid-range drivers, paired with RAAL ribbons. I have high expectations on this new project and I’m eager to start this summer build project. More information on the new “Sequence Three – Grand Reference” project is coming soon. Read full article |Comments Off on Project Scrapped! 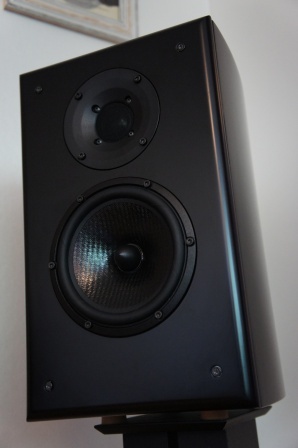 I’ve published new driver unit measurements for an upcoming new loudspeaker design Prestigious Two – Monitor DXT. They are both great drivers with their own unique sound character.